A puppy thought to be dead for five weeks after she fell off a fishing boat in Southern California was joyfully reunited with her owner in San Diego Thursday night after being rescued by the Navy. Commercial fisherman Nick Haworth embraced Luna, his blue-eyed 1 ½-year-old German shepherd, as she jumped into his arms, tail wagging. "Luna!" Haworth squealed, as the pup pranced around him. Haworth scooped her up, rubbed her belly and gave her a big kiss. "She still smells like fish," Haworth told NBC 7 with a smile. "I can't believe this dog is alive. I never thought I'd see her again." "I'm just glad to have her home," he added. Prior to their reunion, the last time Haworth saw his beloved companion was Feb. 10. That day, very early in the morning, Haworth, Luna and his crew were out on a commercial fishing boat about two miles off the coast of San Clemente near Naval Auxiliary Landing Field San Clemente Island (SCI). Luna vanished as Haworth and his crew were bringing in their fishing traps. Haworth said one minute his pup was there and the next she was gone. "That was a rough day," he recalled. "It was about 3 a.m. I was looking around and I couldn't find the dog. I just couldn't find the dog. I started freaking out, honestly." Frantic, Haworth called officials at SCI from his fishing boat to report that his dog had fallen overboard and was nowhere to be found. He said she might try swimming to shore. 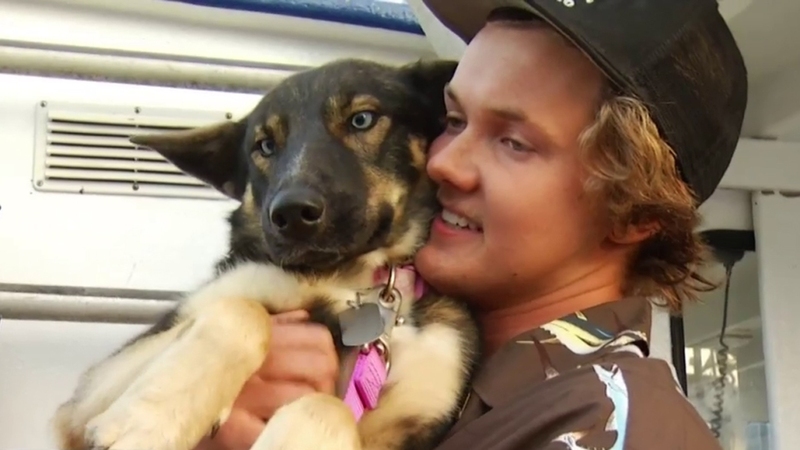 Video showing the reunion of Nick Haworth and his German Shepherd Luna who was lost at sea and then recovered weeks later. Haworth thinks Luna may have been distracted by something in the water and jumped in. All he knew was that he had to find her. 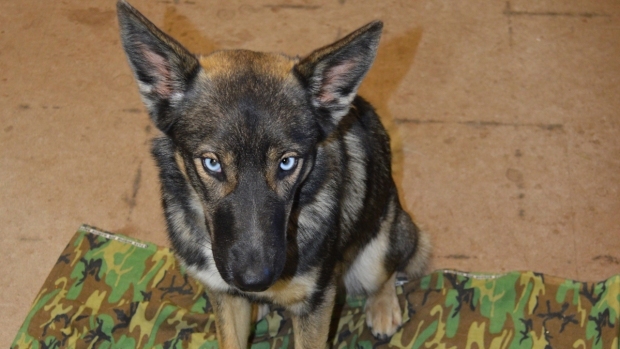 He stayed at sea for two days looking for his dog, while Navy staff at SCI searched the island for Luna. 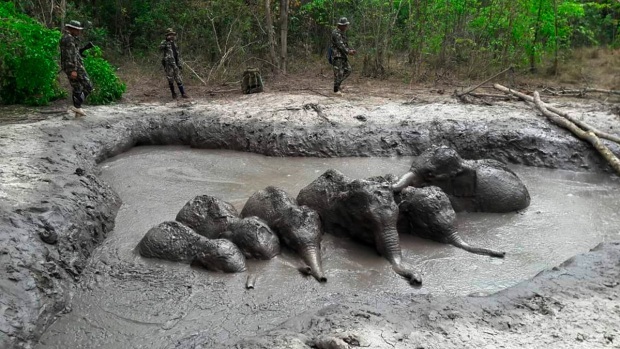 "We went on a full-fledged search with spotlights and everything. It was so dark. We couldn't find her by the time the light came up. I thought she had already drowned — or made it to the island," he explained. After about a week of searching, Luna was presumed lost at sea and dead by both her owner and U.S. Navy officials. "I gave up," said Haworth. "I went through a lot of time where I was so sad about losing my dog. She's behind me all the time — every minute we're on the boat." More than a month passed. During the time without Luna, Haworth said he often returned to San Clemente Island to go fishing, bringing binoculars every time so he could take another look over the sea, just in case. "[I had] to make sure she wasn't there, waiting on me," he said. "I was heartbroken. I didn't know whether she was alive or dead, what to think. It was really devastating to go from having this dog next to me every minute of my life to, all of a sudden, she's gone in a flash." This past Tuesday, March 15, Navy staff spotted Luna on a road on SCI. Just as her owner had hoped, the pup had somehow managed to make it ashore. She ran right up to the Navy personnel. "They were shocked," Naval Base Coronado PAO Sandy DeMunnik told NBC 7 on Wednesday. She said the pup was undernourished but in "good spirits." When the Navy first reached out to tell Haworth they had his dog, the pup's owner said he simply couldn't believe it. 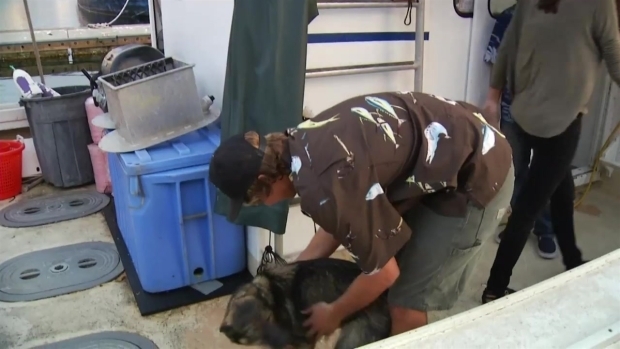 NBC 7's Omari Fleming reports on the return of Luna, a German Shepherd who was believed to be lost at sea. "I was in awe — pure disbelief at first," he said. "Then I had to see a picture of her. I was like, 'I have to make sure [it's my dog]. When I saw [that it was Luna], I was overwhelmed with joy. Probably the happiest I've ever been in my entire life." "I'm not a guy of many emotions but, man, this had me stirred up. This had me in tears. It's a beautiful thing to get my dog back," he added, petting Luna as she calmly lay next to him. 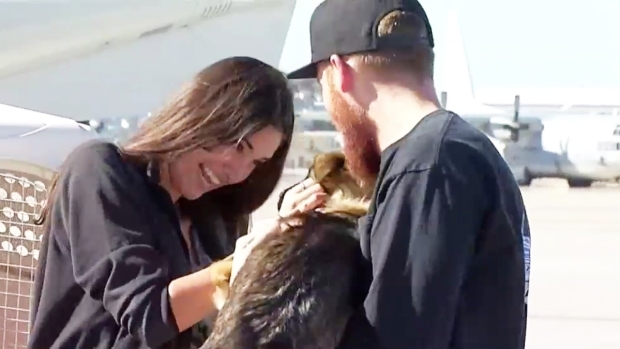 The Navy flew Luna from San Clemente to Naval Air Station North Island in Coronado Wednesday to be reunited with her loved ones. Haworth was out of town, so Luna was turned over to his close friend, Conner Lamb. Lamb and Luna's reunion in Coronado was joyous. Lamb, who has worked many times on the fishing boat with Luna and her owner, was ecstatic and amazed she's alive. Haworth rushed home Thursday to have his own reunion with his four-legged friend. "To have my best friend back is really nice," he said. Haworth said he can never thank Navy officials enough for bringing Luna home safely. 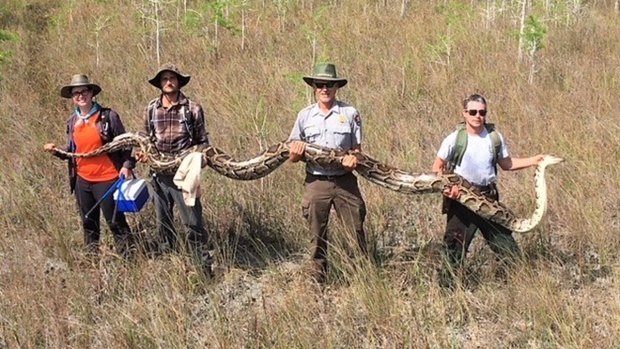 "They never gave up and found her," he said. "I'm very appreciative. To get her back in good health is a miracle. It's the greatest gift I've ever received." Haworth said the Navy gifted Luna with a keepsake: a dog tag that reads "Keep the Faith." The dog now wears it around her neck. Haworth said Luna is a bit skinny, but he wasn't surprised by her slender figure since the pup likely had to forage for food on the island. He said he planned to treat Luna to a nice, homecooked meal. Next time Luna accompanies him on a fishing boat, Haworth said he will be sure to outfit her with a doggie life jacket and a reflector so he can keep an eye on her. He may also keep her on a leash while at sea. "[I'm] not letting her go again, that's for sure," he said.